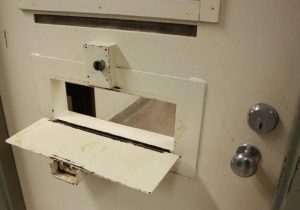 I have recently filed a lawsuit against Georgia State Prison for the attempted suicide of an inmate after he was found to be experiencing a psychotic break and in need of emergency psychiatric attention. The prison’s idea of “emergency” psychiatric referral was an appointment with a psychiatrist five days later. Of course, my client, Nicholas, who was only 19 years old at the time, never made it to that appointment scheduled five days later because less than 24 hours after being diagnosed with experiencing a psychotic break he attempted suicide by hanging himself with his bed sheet in his cell. His cellmate yelled and yelled for help. After a prison guard finally arrived at the cell, the guard saw him hanging but refused to get him down from the bed sheet noose. Instead, that guard radioed for assistance and the other guards, rather than helping Nicholas down from hanging, retrieved a camera to film him hanging. That video, as you can imagine, is graphic. Then the camera runs out of battery charge. So the guards leave Nicholas hanging and retrieve a second camera (I am NOT making this up) to continue filming him. Finally, the guards go into the cell to remove Nicholas and find that he is still alive. They begin CPR. They are able to revive him, but due to the lack of oxygen for such a long time, he is left in a persistent minimally conscious state and suffered irreversible brain damage. He now requires 24 hour care in a nursing home. He cannot eat, he cannot speak and he cannot move by himself. To say this case is tragic would be a massive understatement. So, I have been immersing myself in jail and prison suicide cases and the applicable law. Essentially, the only way to sue a jail or prison successfully on this type of constitutional rights violation is under a Federal statute, 42 U.S.C. § 1983. Under this statute, the plaintiff must prove that the state actor (individual state or government employee) acted with “deliberate indifference” to the constitutional rights of the inmate. The determination as to whether a state actor acted with deliberate indifference in violation of either the Eighth or Fourteenth Amendment consists of an objective and subjective inquiry. Hopper v. Montgomery Cty. Sheriff, 3:14-CV-158, 2017 WL 495511, at *12 (S.D. Ohio Feb. 6, 2017). “Deliberate indifference requires the following: (1) subjective knowledge of a risk of serious harm; (2) disregard of that risk; (3) by conduct that is more than gross negligence.” Shuford v. Conway, 16-12128, 2016 WL 6820764, at 6 (11th Cir. Nov. 18, 2016). The plaintiff must show the constitutional right allegedly violated was “clearly established” at the time of the incident, so that an officer cannot claim as a defense that he “didn’t know” his treatment of an inmate violated the inmate’s constitutional rights. “In this circuit, the law can be ‘clearly established’ for qualified immunity purposes only by decisions of the U.S. Supreme Court, Eleventh Circuit Court of Appeals, or the highest court of the state where the case arose.” Jenkins by Hall v. Talladega City Bd. of Educ., 115 F.3d 821, 826 n.4 (11th Cir. 1997). This inquiry is limited to the law at the time of the incident, as “an official could not be reasonably expected to anticipate subsequent legal developments.” A plaintiff can show the constitutional right violated was clearly established in three different ways: (1) case law with indistinguishable facts clearly establishing the constitutional right; (2) a broad statement of principle within the Constitution, statute, or case law that clearly establishes a constitutional right; or (3) conduct so egregious that a constitutional right was clearly violated, even in the total absence of case law. Lewis v. City of W. Palm Beach, 561 F.3d 1288, 1291–92 (11th Cir. 2009); see also Hope v. Pelzer, 536 U.S. 730, 743, 122 S.Ct. 2508, 2517, 153 L.Ed.2d 666 (2002) (noting that the reasoning of this Circuit’s holdings, even if a case did not involve the same precise facts, sends a sufficient message to reasonable officers in this Circuit for the purposes of the “clearly established analysis”).